It’s hard to imagine how Isamu Noguchi ever had time to sleep. 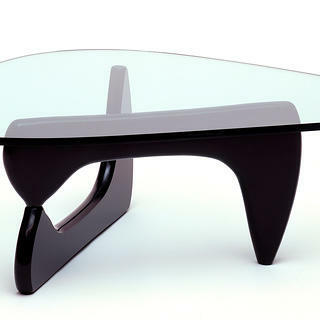 The Japanese-American artist created internationally renowned sculptures and gardens, groundbreaking set designs for the Martha Graham Dance Company, and the sinuous, eternally knocked-off Noguchi coffee table (shown above)—and those are just for starters. The life story of this Midcentury Modern master is just as action-packed as his career, from a love affair with Frida Kahlo to a voluntary stint in a Japanese-American internment camp during World War II. Isamu Noguchi at work in 1963. As a young man, Noguchi apprenticed with the Mount Rushmore sculptor Gutzon Borglum, who told him he would never be a successful artist. He had better luck in Paris, as an assistant to Constantin Brancusi. 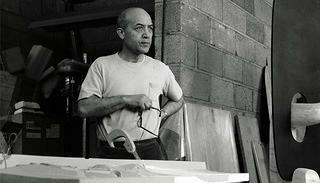 Noguchi spent much of his subsequent career in New York, where he met friends and collaborators such as Buckminster Fuller, Alexander Calder, and Graham. Unlike many of his contemporaries, Noguchi didn’t concern himself with traditional divisions between art, design, and landscape design. 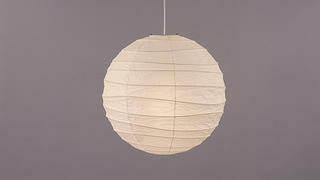 His Akari light sculptures, for example, serve as both practical light fixtures and ethereal paper works. 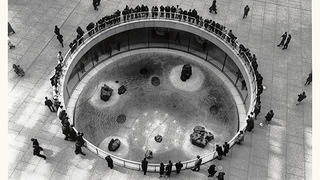 And his Sunken Garden (1961-64) at Chase Manhattan Bank Plaza in New York is both a garden and a sculpture. He even designed playgrounds, including the Isamu Noguchi Playscape in Atlanta. The Sunken Garden at Chase Manhattan Bank Plaza in New York, completed in 1964. One of Noguchi's Akari Light Sculptures. 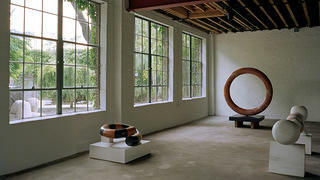 An installation at the Noguchi Museum in Long Island City, New York. The museum was founded and designed by Noguchi, who died in 1988. 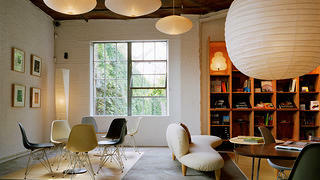 The shop and cafe at the Noguchi Museum contains furniture by Noguchi and contemporaries such as Charles and Ray Eames. 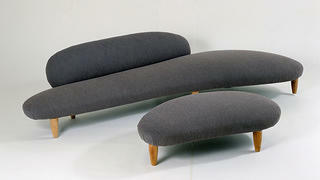 The Freeform "Cloud" Sofa and Ottoman, circa 1948. The artist’s experience at the Poston War Relocation Center in Arizona was the subject of a Noguchi Museum exhibition called Self-Interned, 1942, which ran through January 7, 2018. Noguchi wanted to help improve the daily existence of the internment camp’s residents through design, and he thought the best way to do so would be to live among the community, which he did for seven months. But the other internees didn't trust him, and the government officials who had encouraged the idea didn’t follow through on their promises to work with him on building new recreation spaces at Poston. After he finally extricated himself from the camp, he periodically returned to work that referenced his time there. 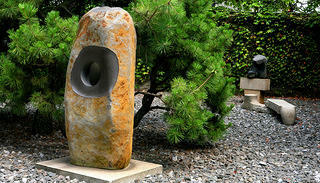 All of the plants in the Noguchi Museum's gardens are native to the United States and/or Japan. Interest in Noguchi seems to be growing; the museum saw its attendance grow by almost 70 percent between 2014 and 2017. If getting to New York isn’t an option, the Nelson-Atkins Museum of Art in Kansas City, Missouri, has the largest collection of his sculptures in a public setting, outside of New York and Japan. At South Coast Plaza, a shopping mall in Costa Mesa, California, you can visit a 1982 Noguchi sculpture garden called California Scenario. This story was updated on May 9, 2018.